Tune Marimbas, Xylophones, Bells and all keyboard percussion instruments using techniques based on J. C. Deagan master tuners. Repair and/or replace damaged bars, using authentic Honduras rosewood, top-grade alloys for metal bars, paduk where needed, or synthetic where needed. Upgrade or replace complete keyboards with premium materials. Refinish all parts such as bars, resonators and frames, using our special stains, to protect your equipment without sacrificing sound quality. Repair and/or replace damaged frames or resonators and adjust to specifications. Create a custom extension of bell sets from the original G to C range, to an extended range of F to D.
We also offer our customers the option to buy new or refurbished equipment in excellent condition, from our showroom. From heavy use over time, bars of any material can be knocked out of tune. At Century, we use techniques based upon those developed by J. C. Deagan. We can tune to any desired pitch standard, whether it be A440, A442, or any desired pitch. In 1927, Henry Schluter developed harmonic tuning for keyboard instruments, which is still practiced today, where applicable. In xylophones, this means quint tuning; in marimbas and vibraphones, this means octave tuning. Harmonic tuning not only tunes the fundamental, but also tunes the proper harmonic above it. Without this technique, the bar's overtones can be out of tune and the bar will produce a slightly dissonant sound, especially when not struck dead center. With harmonic tuning, the overall sound is improved, resulting in bars that are more in tune, with improved sound production. Bars and other components of mallet instruments can become splintered, chewed up, or even cracked with heavy use. This can also happen over time, or as the instrument is moved. In most cases, repairing damaged bars breathes new life into the instrument, and increases its lifespan. Cracked and splintered bars can be re-molded to their original shape and retuned to their desired pitch. This saves you from purchasing brand-new bars, saving you time and money. 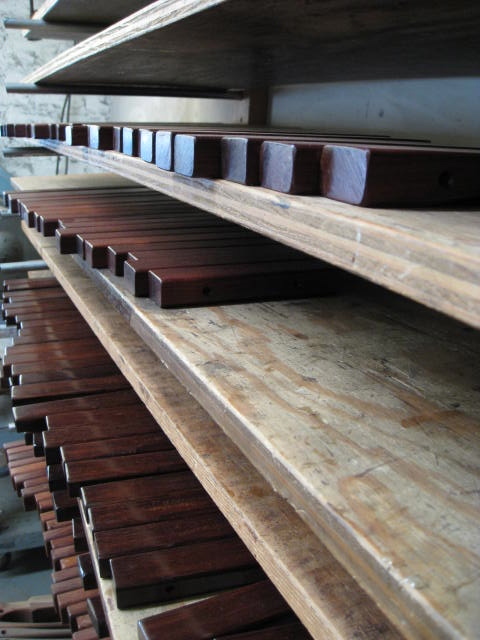 When replacement bars are needed, we use only authentic aged Honduran rosewood, top-grade alloys for metal bars, and paduk or synthetic materials when needed. Cracked chimes do not mean the end of the road for these instruments. 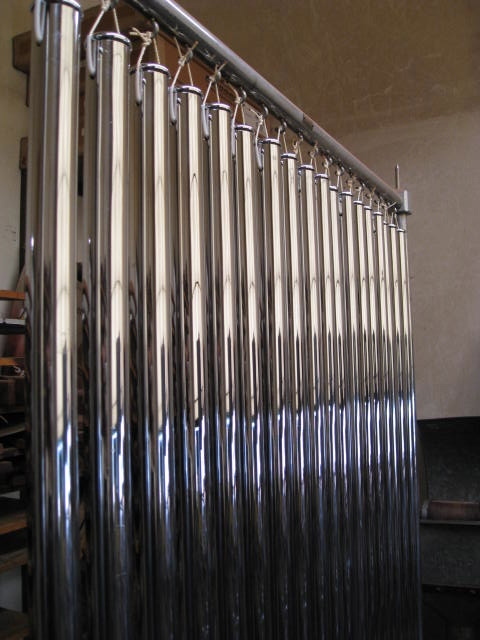 Although replacements may be required, most multiple cracked chimes can be recut, thus using recut tubing to replace the subsequent note. In most cases this eliminates the need for purchasing brand new chime tubes. The refurbishment of frames and resonators can also be of great benefit. Having solidified end-pieces, rails or keybeds, braces, and resonators will lengthen the life of any mallet instrument. Furthermore, the replacement of proper felts, cords, and insulators can provide you with less extraneous noise. Heavy use and age can also be responsible for poor resonance, and just an overall worn look to your instrument. A full refinish will not only give a second life to any instrument, but an also instill a sense of pride in displaying your keyboard, as well as performing on it. In this process, all parts, including bars, are stripped and cleaned to the raw material. Everything is refurbished with appropriate stains and enamel finishes. Bars are checked for defects, cracks, and splintering, and repaired before tuning and refinishing.